Passed away Peacefully on 14.4.2019. Beloved Wife of James and Loving Mother of Jo-Anne, Julie and Mark. Loving Mother-in-Law of Peter and Nichole. Adored Grandmother of 9 and Great-Grandmother of 13. You will always be loved and remembered as you once were. 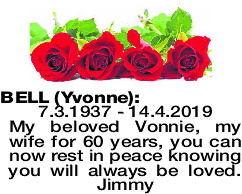 The Funeral Cortege for Mrs Yvonne Bell of Bassendean, formerly Menora will arrive at PINNAROO Valley Memorial Park, Whitfords Avenue, Padbury at 10:30am on MONDAY (29.04.2019) for a Cremation Service. 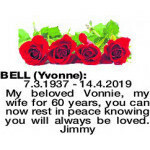 Condolences to Jim, Julie, Jo-Anne and Mark. Many fond memories of visiting and babysitting. 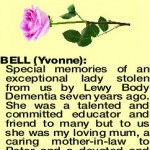 BELL YVONNE Special memories of an exceptional lady stolen from us by Lewy Body Dementia seven years ago. 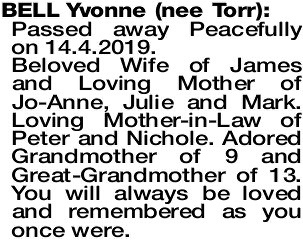 She was a talented and committed educator and friend to many but to us she was my loving mum, a caring mother-in-law to Peter and a devoted and very proud grandmother to Ashleah, Alexander, Annalise and Andrew. Though her illness didn't allow her to know her great grandchildren Jaxon, Cooper, Lily, Eva, Bentley, Clara and Macie I know she would have been delighted by them. Rest In Peace my dear mum, you deserve it. A respected, innovative, inspirational and much loved member and past President of the Retired Teachers' Association WA. Deepest sympathy to Jim and family. Treasured friend for over 60 years of Nan and Bob (dec) Cahill. Loving sympathy to James and family. So many happy memories to cherish.